Halloween is just around the corner. Have you thought about dressing up, trick-or-treating, or how you will decorate your home for the holiday? Whether you decide to go all out for the festivities or opt to focus on just a few spooky details—now is the perfect time to give your home-sweet-home a little devilish air. Annalee is all about helping make your home look a little scary and fun for Halloween! Don’t miss the chance to deck out your home with spooky spirit. On Halloween, ghosts, ghouls, and goblins often whisk about, but the holiday wouldn’t be complete without a mysterious witch! 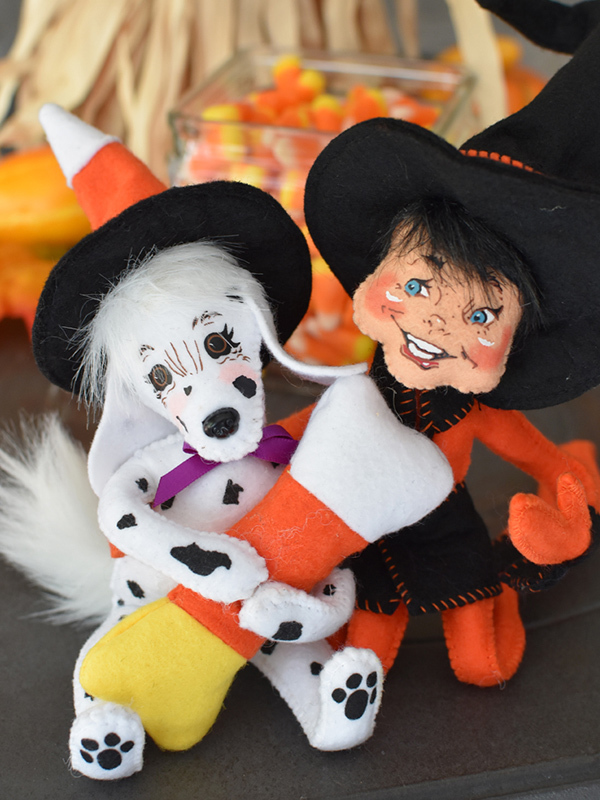 Whether you are looking for a stand-alone witch doll or considering one of our popular Halloween decorating sets, make sure you have a witch to bewitch your home this season! Annalee offers a selection of witches (some more friendly than others) to enchant your Halloween celebration. Halloween is also pumpkin season! Beautiful seasonal displays greet us with a smorgasbord of gourds and brilliant orange pumpkins! Whether you are carving your own, hanging festive window clings, or snacking on some delicious pumpkin Mellowcremes—make sure there are some eye-popping pumpkins in your Halloween festivities. Every year costumes are carefully chosen, bowls of candy are filled, and trick-or-treaters embark on the neighborhood, going house-to-house in search of sweet treats. Trick-or-treating is a fun tradition and we all love to see what costumes the kids come up with each year. Annalee loves to celebrate trick-or-treaters and has created a series of dolls—introducing a few each year—that show off a classic favorite costumes. Start your collection of trick-or-treaters today with our 2017 Trick or Treat Set! And you won’t want to miss our Wizard of Oz series! The black cat is one of the most recognizable symbols of Halloween—and often an instigator of superstitions. Black cats and witches go hand-in-paw as spooky symbols of Halloween. So if you want to add some haunt and spooky speculation to your festivities, add a black cat to your decorations! Annalee has many to choose from. Tip #1 – Create a Halloween Wreath! Greet your trick-or-treaters and fall guests with a seasonal wreath! The ability to pose Annalee designs makes them a great accoutrement to any seasonal wreath. You can easily attach one your favorite Halloween designs to a basic wreath to make it a true showstopper! Everyone will wonder where you found such a fun or potentially scary Halloween decoration. Tip #2 – Discover Coordinated Collections! Not sure what to get this Halloween? We know it can be difficult to choose your favorites. Annalee makes decorating for Halloween a snap with coordinated seasonal bundles. Our trained team of designers has hand picked favorite items to provide you with one-stop shopping and unique themed collections that will certainly add some seasonal flair to your home. These also make great gifts! Don’t Miss the 2017 Wizard of Oz Series! Tip #3 – Focus on the Treats! Let’s face it. Halloween is about the treats (well tricks, too). Create display around dining areas, in the kitchen, and, most importantly, near the candy bowl! Our elves are the perfect hosts for your cauldron of candy corn.